PARIS (AP) — French investigators are asking the European Parliament to lift far-right EU lawmaker Marine Le Pen’s immunity so that she can face possible prosecution over suspected misuse of parliamentary salaries. Le Pen, a leading candidate in France’s two-round presidential election on April 23 and May 7, calls the investigation unfounded and an effort to poison her presidential bid. She enjoys immunity from prosecution as a European Parliament member. 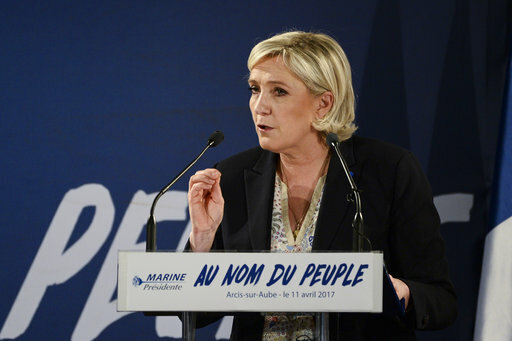 The case concerns accusations that Le Pen and others in her anti-immigration National Front party used parliamentary aides for party activity while they were on EU-financed salaries. A top Le Pen aide was charged in the case with receiving money through a breach of trust. The Paris prosecutor’s office said Friday that investigating judges issued the request to lift Le Pen’s immunity, and it was being transmitted by the French government to the European Parliament. The parliament did not comment on the move Friday but several procedural steps are still required before the legislature might hold a vote on it. Le Pen said Friday on Francetvinfo that she’s unsurprised by the request, calling it “the normal procedure.” Le Pen has repeatedly refused to show up for police questioning, citing her immunity. The parliamentary salary probe is one of multiple investigations involving Le Pen or her party, though none is expected to come to trial before the French presidential election. The European Parliament last month lifted Le Pen’s immunity in another investigation, over tweeting gruesome images of Islamic State violence. Le Pen argues that European Parliament investigators are singling her out because of her anti-EU views. She wants a referendum on pulling France out of the 28-nation EU and the 29-nation shared euro currency. Such a move by France — an economic powerhouse and founding member of the EU — could kill the bloc. Polls suggest that Le Pen is a top contender for the April 23 first round presidential election and could advance to the May 7 runoff, but would then lose to centrist candidate Emmanuel Macron. If Le Pen wins, she would enjoy immunity from prosecution as president. Meanwhile, Facebook announced that it has targeted 30,000 fake accounts linked to France ahead of the presidential election, as part of a worldwide effort against misinformation. The company said Thursday it is taking action against those accounts and is removing sites with the highest traffic. Facebook and French media are also running fact-checking programs in France to combat misleading information, especially around the presidential campaign.